Imagine a world in which you wake and stand every moment! This is a world without furniture. Furniture allows us to recline, sit, work and collect! We collect things to sit on, eat on, write on, and sleep in. Where does all of this furniture come from? Who makes furniture? How is furniture made? This journey takes us into the history of human furniture and offers opportunities to mock up your own ideas about how people should interact and function with useful objects in their daily lives. People use furniture to store belongings, to sit or lie down, to work, eat, play and socialize. Early furniture consisted of padding to sit or sleep on. It was created to be mobile and moved from place to place. In fact, the French word for furniture is actually “le mobilier”. The chair, table, bed and trunk (storage) were the most common types of early furniture. Trunks for storing clothes and supplies eventually became large wardrobes or armoires and served as mini closets! 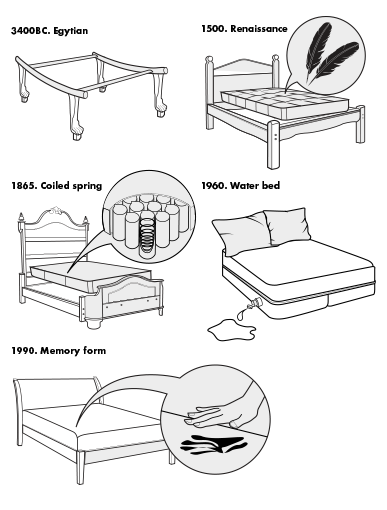 Early furniture was often multifunctional serving as a table, and transforming into a bed. Furniture design and construction became a cultural expression of collection and care as people created and kept pieces of value. A tradition of craft developed in specific countries with specific artisans. Every time period creates new types of furniture for new types of collections and new ways of working and living. Furnish your world with furnishings! 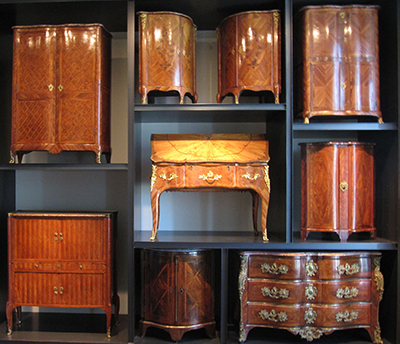 As cities grew and new forms of commerce evolved, so too, so did types of furniture. Upholstering is a method of covering parts or all of furniture with padding (and sometimes springs) and material so as to make it more comfortable. Early materials were animal hides and leather. Later materials included burlap to boiled wool, felt, velvet, chintz, cotton and other woven and embroidered materials. With new materials came new types of fasteners- tacks, nails, buttons, clips and grommets. 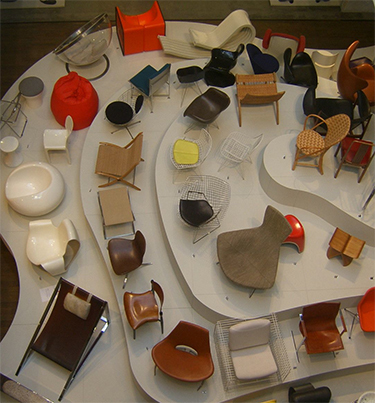 Take a look at the History of Furniture Timelines and Museums in the explore resources. Find a period of furniture that interests you and research what it was used for and how it was made. Write a two-page report on key pieces of furniture from that period describing in detail the style and method of construction. Next, look at the contemporary furniture lines and read about contemporary furniture makers. Chose one of the designers or retailers and write a two-page paper about the furniture designs that they produce. Be sure to use descriptive words in explaining the aesthetics, structure, materials and purpose of the furniture. Create a Venn diagram that shows what is the same between the different periods of furniture and what the objects have in common. Think about how furniture changes but still serves to assist our daily lives. People are different sizes from infancy to senior. Yet with all of people’s different sizes, there are some furniture standards that help furniture designers design new ideas that will fit the most people at a given time in life. In this activity you are to research basic chair, bed and table dimensions. Draw a furniture key to scale and dimension the pieces with typical sizes. ½"=1'0" is a good size to see the relationships between furniture pieces and the rooms that they will be placed in. 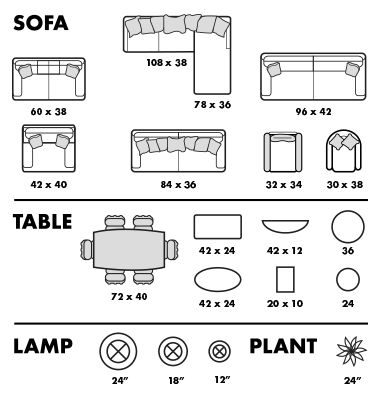 Try drawing different types of seating in different sizes- chairs, stools, loveseats, sofas and sectionals. 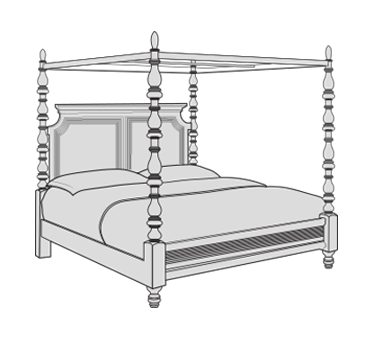 Try drawing twin, double, queen and king size beds. Try drawing small, medium and large tables. Of course there are always be exceptions where furniture sizes respond to specific situations. Know your dimensions! Create a furniture template! Furniture designers study designs through sketches of ideas and quick initial modeling. In this activity explore ideas for miniature furniture for a dollhouse. Using craft materials (paper, cardboard, sticks, felt, glue, etc., design and construct pieces of miniature furniture. Think of your scaled design as a model of furniture or the setting for a display. Make sketches of your ideas first to help you visualize what you would like to make. Create a room of miniature furniture. Take a look at the miniature Thorne Rooms created by Mrs. James Ward Thorne of Chicago. Constructed at the scale of one-inch equals a foot, Mrs. Thorne worked with craftsmen to re create entire model rooms of European interiors from the 17th century to the 1930’s. 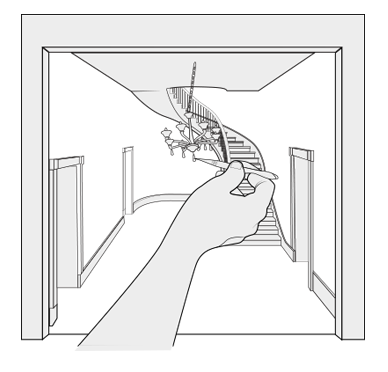 Create your own miniature room on a piece of 8 ½ x 11” paper. Use this for the floor. Scale your furniture to fit your paper room. Marvel at the marvels in miniature! Bean bags, director’s chairs, ottomans, stools, chairs, loveseats, sofas and sectionals all invite us to sit. Some chairs are hard and some are soft. Some become identified with special people in our life. Some are heirlooms from our ancestors. What kind of chairs do you need and what do you want them to look like? How many people do you want to be able to sit together at one time? Will it be a loveseat? Will you create a sofa? Think about a Chaise lounge. How do you want your seating to function? Will it be formal or informal? Will you make it soft or hard? Will it be oversized or modular? Will it be singular or in a series or grouping? What relationship do you want them to have with other pieces of furniture (desks, counters, tables, entertainment, view)? What relationship do you want them to have with the space? This is your chance to design and model something to sit in. singular or in a series or group. Brainstorm ideas for chairs for working, waiting, poolside, in a sports stadium or theater setting. Make some sketches of your chair ideas looking at form, structure, aesthetics, structure, material and detail. If you have already achieved chair designs in the chair journey, try a different kind of seating. Present your conceptual sketches, conceptual models, and design development models. Where do you like to eat? Do you like to sit at a table or sit on a stool at an island? Start noticing the relationship between chair height and type and table height in the next few days. Which tables are too high, or which chair settings are too low? A designer that works with the food and restaurant industry must take care to get the relationship between the chairs and tables just right. In this activity you will design a setting for eating. It can be a breakfast nook, a banquette, a dining room table setting or an entertainment island. Draw your setting for eating in plan and elevation. Make a miniature model of your setting. Most people are busy all day and when the day is at an end, they look for a place to sleep. While people can and do sleep sitting up, the most comfortable position is reclining or lying down. Do you know that most people spend one third of their lives….sleeping! This makes the design of the bed important. The bed is used for other things as well. Some people work in bed on their computers or watch TV. Others eat in their bed. The bed is the place of dreams and respite. Design your dream bed. How big will it be? What will it look like? Will it have a headboard? Will it have a canopy? Will it be raised or on the floor? Research bed sizes. Design your dream bed. Draw and model where you would like to rest. People collect stuff. They collect books and toys and clothes and objects and tools. Where do they put all of this stuff? Furniture that stores, or puts things in place, helps us to organize our things. It also reduces clutter. There are many known types of storage furniture. Early on, chairs had seat storage; trunks carried clothes and goods; wardrobes and armoires held clothes and shoes. Bookcases held library collections. Writing tables and desks often became separate from dining tables and had hidden drawers for important documents and writing supplies. After main tables came end tables, side tables, sofa tables, bedside tables, phone tables and coffee tables. Bureaus or dressers, tall or long were for folded clothes and seasonal dress. Kitchen cabinets were developed to hold silverware, pots and pans, and cooking utensils. Pantries stored dried goods. People have invented all kinds of storage units as their conveniences and comforts expanded. Think about what you want to store and design a storage unit for it. You can design a storage unit for home or school. Mock up your storage unit in a model and draw plans, sections and elevations that show material, finishes and dimensions. Store your stuff! If working in your classroom separate into teams of two to three people. If working by yourself be sure to share your ideas with others and get input and feedback about what you are planning. Design a piece of furniture that can store supplies. You can choose books, papers, art materials or making tools. Your design should respond to how what you have selected to store, needs to be stored. Will you hide or expose what you are storing? Will you use shelves, hooks, lines or other sources of hanging, sitting, resting supplies in your storage unit? all of these and more! Early furniture was often multifunctional. Who created the sylistic Thorne Rooms?